Making aioli & mayonnaise by hand provides similar results to making aioli/mayo in a food processor. It requires more elbow grease and a little moretime, but you have finer control, don’t run the risk of the machine running hot and breaking your emulsion, and don’t have to clean a food processor afterwards. 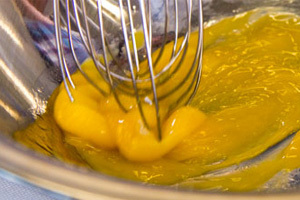 Whisk together the egg yolk(s). Add your flavoring ingredients (for plain mayo, use a splash of white/champagne vinegar and a pinch of salt) to the yolks & whisk to combine. Optional: place a thin towel over a large pot and use it as a rest for the bowl. This makes it easier to whisk while drizzling. Start drizzling the oil into the yolks in small drops, while whisking constantly. As the mixture starts to come together, you can start adding the oil in larger quantities. Continue whisking in oil until you reach your desired consistency. If you add a little too much oil, try adding a touch of water to get the yolks to grab the extra oil. Taste & add salt, any folded in flavoring ingredients, and additional acid (lemon juice, vinegar, etc.) as needed. If the aioli is too thick, but you don’t want to add additional acid, you can also thin with a little water. How Much Oil Should You Use? The amount of oil a single egg yolk can emulsify is the subject of ongoing debate. Some people/books will tell you not to go above a half cup per yolk, others will say you can go up to a cup, but no higher. Pretty much any oil can be used to make mayo/aioli as long as you take the flavor of that oil into account. We’ve used grape seed, olive oil and vegetable oil and blends of oils with great results. McGee doesn’t recommend using extra virgin olive oil as the sole oil in your mayo/aioli (as a smaller part of an oil blend to add flavor should be fine), because the compounds that give EVOO its different mouth feel, stronger flavor and lower smoke point can make emulsions unpredictably unstable. While aioli is technically a mayonnaise flavored with garlic (and other ingredients if desired), the term is often used to refer to any flavored mayo, whether it has garlic in it or not. Add the mustard, vinegar & salt in step 2 of the above technique. Add the chives in step 6. When adapting the below recipes to the hand-whisked technique, you’ll probably want to very finely chop, paste, or puree the solid flavoring ingredients called for in these recipes before mixing them in.